The lowest gain that can be obtained from a noninverting amplifier with feedback is 1. When the noninverting amplifier is configured for unity gain, it is called a voltage follower because the output voltage is equal to and in phase with the input. In other words, in the voltage follower the output follows the input. Although it is similar to the discrete emitter follower, the voltage follower is preferred because it has much higher input resistance, and the output amplitude is exactly equal to the input. To obtain the voltage follower from the noninverting amplifier, simply open the input resistance R1 and short the feedback resistor Rf. Figure shows the circuit diagram of a VOLTAGE FOLLOWER, in which the output voltage is fed back to the inverting terminal of operational amplifier (op amp); consequently the gain of the feedback circuit is 1. As we stated in the above paragraph, voltage follower has the highest input impedance or resistance of any op amp circuit. For this reason it is used to reduce voltage error caused by source loading and to isolate high impedance sources from the following circuitry. For a Dc coupled voltage follower, the input voltage is directly applied to the non-inverting input terminal. 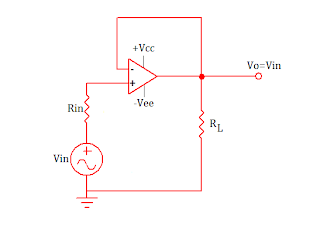 Bias current Ib is supplied through the input source resistance Rin. If the input source resistance is high (or if the voltage follower is driven from high input source resistance) because of the voltage drop across it, the voltage at noninverting input will be in error. In other words, the output and input voltage will not be equal. 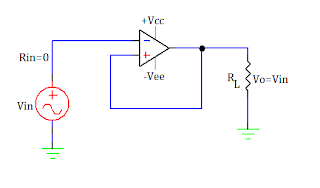 To remedy this problem, an op amp with low input bias current should be chosen as a voltage follower when working from high input source resistances. Obviously, the best choices are op amps specially designed as buffers or voltage followers. These op amps have low bias currents and generally higher slew rates. Figure shows the circuit diagram of an Ac coupled voltage follower with input resistance bootstrapped. When an ac input voltage rides on a dc level, in order to block the dc level a coupling capacitor must be used in series with the input. 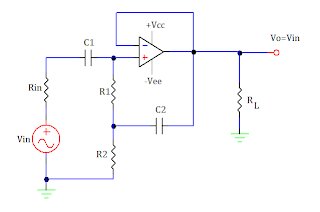 But whenever a voltage follower is ac coupled, it is necessary to connect a bias resistor to provide a ground path for Ib. however this bias resistor drastically reduces the input resistance of the follower circuit. In fact, the input resistance is equal to the bias resistance. Therefore to get higher input resistance, the bias resistor is bootstrapped as shown above. In this circuit the input is applied through a coupling capacitor C1 to the top of R1, and simultaneously the output voltage is coupled through capacitor C2 to the bottom of R1. Since the gain of the circuit is 1, the voltage drop across R1 is (Vin-Vo), which is almost zero. Therefore, the current through R1 is almost zero, and the input resistance, in turn, is incredibly high. Voltage followers are useful in such applications as active filters, sample and hold circuits, and bridge circuits using transducers.